The shadow of Bhaal has come over Baldur's Gate, summoning monsters and other horrors from the darkness! As you build and explore the iconic city's dark alleys and deadly catacombs, you must work with your fellow adventurers to survive the terrors ahead. That is, until some horrific evil turns one — or possibly more — of you against each other. Was it a mind flayer's psionic blast or the whisperings of a deranged ghost that caused your allies to turn traitor? You have no choice but to keep your enemies close! 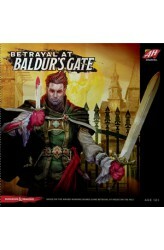 Based on the award-winning Betrayal at House on the Hill board game, in Betrayal at Baldur's Gate you'll return to Baldur's Gate again and again thanks to the fifty included scenarios only to discover it's never the same game twice. Can you and your ..
Betrayal at House on the Hill quickly builds suspense and excitement as players explore a haunted mansion of their own design, encountering spirits and frightening omens that foretell their fate. With an estimated one hour playing time, Betrayal at House on the Hill is ideal for parties, family gatherings or casual fun with friends. 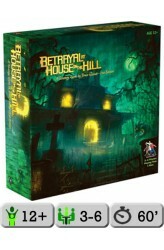 Betrayal at House on the Hill is a tile game that allows players to build their own haunted house room by room, tile by tile, creating a new thrilling game board every time. The game is designed for three to six people, each of whom plays one of six possible characters. Secretly, one of the characters betrays the rest of the party, and the innocent members of the party must defeat the traitor in their midst before it’s too late! Betrayal at House on .. The house on the hill has a wicked reputation. Those who dare to darken its door often leave steeped in madness and despair — if they leave at all. 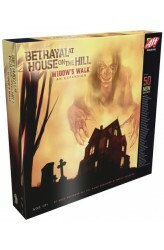 Now the horror reaches new heights with Widow's Walk, the first-ever expansion for the critically acclaimed board game Betrayal at House on the Hill. The house is expanded with the addition of twenty new rooms, including the roof, a previously unexplored floor. Also in its halls you will find new monsters, items, omens, events, and fifty brand-new haunts, penned by lead developer Mike Selinker's all-star cast of contributors from the world of gaming and entertainment. In Widow's Walk, terror and panic are taken to a whole new level. Enter if you dare. 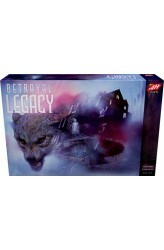 Exit if you can... https://www.youtube.com/watch?v=FE..
Betrayal Legacy marries the concept of Betrayal at House on the Hill — exploring a haunted mansion — with the permanency and multi-game storytelling exhibited by Daviau's Risk Legacy and other legacy games that followed. Betrayal Legacy consists of a prologue and a thirteen-chapter story that takes place over decades. Players represent families, with specific members of a family participating in one story, then perhaps an older version of those characters (assuming they lived) or their descendants showing up in later stories. Why would people keep exploring a haunted mansion for decade after decade, especially when horrible things happen there? Curiosity, I suppose, or perhaps an ignorant boldness that comes from the belief that we know better than those who have come bef.. 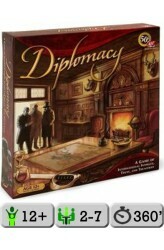 This classic game of pure negotiation has taken many forms over the years. The first Avalon Hill version has perhaps the widest release, but Avalon Hill (Hasbro) re-released the game in 1999, complete with a colorful new map and metal pieces. They recently released a 50th anniversary edition with a new map and cardboard pieces representing the armies and navies. In the game, players represent one of the seven "Great Powers of Europe" (Great Britain, France, Austria, Germany, Italy, Russia or Turkey) in the years prior to World War I. Play begins in the Spring of 1901, and players make both Spring and Autumn moves each year. There are only two kinds of military units: armies and fleets. On any given turn, each of your military units has limited options: they can move into an adjo..
Risk 2210 A.D. is yet another entry in the long series of Risk variants. Set in the not-so-distant future, battles are now fought by machines of destruction, known as MODS, for short. Human commanders still lead these mechanized troops, but these commanders each have special powers and abilities. 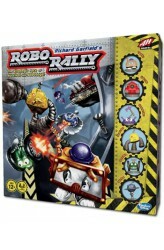 These come into play via the use of Command cards, which add a new dimension to the game. Now, the battle is not just for the continents, but the sea and moon are also battlegrounds. 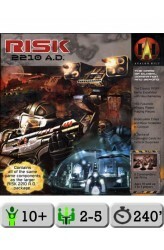 Although much has been added, the basic flavor of the game is still Risk. One welcome change is the institution of a five-turn game limit, which allows the game to play to completion in about three hours. Further, players must also factor in economics in the form of energy. This energy is used to purchase Comm.. Imagine that you're a supercomputer. Now imagine that you're bored. So you dream up a little contest for you and a couple of your supercomputing buddies. Your task is to move one of the stupid little robots out on the factory floor through a series of checkpoints scattered throughout the factory. The wrinkle, however, is that the factory floor is filled with all kinds of inconvenient (if not down-right deadly) obstacles located in various locations: conveyor belts, crushers, flame-throwers, pushers, teleporters, oil slicks, pits, et cetera. 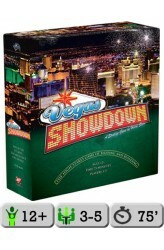 But the real fun comes when the robots cross each other's path, and suddenly your perfect route is something less than that... http://www.youtube.com/watch?v=BJS66Gz0v4E ..
Players compete to build the most famous hotel/casino. Room tiles representing slot machines, lounges, restaurants, and other casino-related places appear on a central board and the players hold auctions to win the rights to have those rooms in their building, garnering them income, population, or fame. Bidding wars escalate, values fluctuate, and designers renovate until finally the hotel/casinos are put to the test to determine whose garners the most fame. https://www.youtube.com/watch?v=eV0i6GaVw6A ..